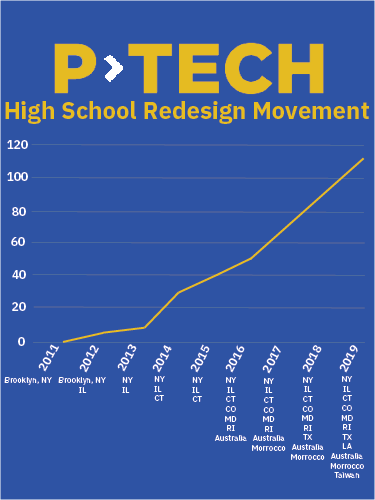 The P-TECH Model is in 110 schools across 8 US states and four countries. The following graph shows the model’s rapid growth since its launch in 2010. The first IBM-inspired P-TECH school, in Brooklyn, NY, where teens earn both a community college degree and high school diploma, held a pre-graduation reception at the Brooklyn Academy of Music on June 2017. Graduates of IBM P-TECH tell their stories about how this innovative program has given them access to educational opportunities and the New Collar workforce. 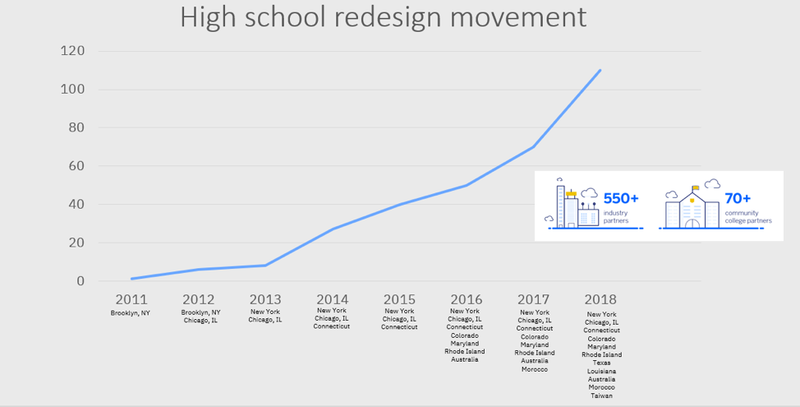 The P-TECH model as a whole is now in its eighth year, and only a few schools have completed all six years – the full grades 9-14, and thus have completion data. 112 students graduated within 6 years or less (as few as 3.5 years) with both their high school and associate STEM degrees. The first class achieved a graduation rate that is over four times the national on-time average for all community college students, which stands at 13%. 555 students completed college courses through February 2018. Students are placed into credit-bearing college courses when ready and do not take remedial courses. The school maps career readiness skills required for both college and career preparation, including workplace learning, mentoring and internships. 100 percent of the first cohort completed high school. 80 percent of students from the first cohort completed paid internships, with a majority at IBM. More than 176 students from the first and second cohorts completed paid internships. 95% of the students completed their high school graduation requirements in 4 years. This compares very favorably with the statewide average of 82.1% for 2016-17 (the latest published data). 29 students already completed an AAS in a STEM field by the end of 4 years, 2 years ahead of schedule. Across the board, P TECH students had already earned an average of 25 college credits by the end of 4 years, placing them in an excellent position to finish their Associate Degrees in 5-6 years. The completion rate for SUNY Community Colleges at a comparable point is 12.8%. 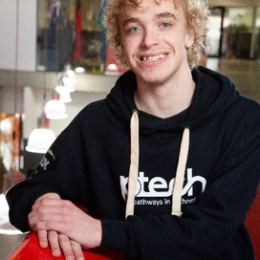 No P-TECH student has taken a remedial or developmental education course. A full 50% of students entering SUNY community colleges take at least one non-credit bearing remedial course, requiring significant public and personal investment (Note: Remedial course cost $94 million annually in New York) and significantly reducing their potential to complete a degree. These early results demonstrate the value of the P-TECH model and the return on investment for the support of these schools. While there are certainly variations across schools, this is to be expected given the broad scale and diverse communities served by this ambitious initiative. We have demonstrated the flexibility and broad relevance of the model and we continue to learn more about the characteristics of quality implementation and the most effective approaches for support and intervention.